Ceilidh Honda in New Glasgow, Nova Scotia is eager to tailor an Odyssey shopping plan to suit your 2018 Honda search. 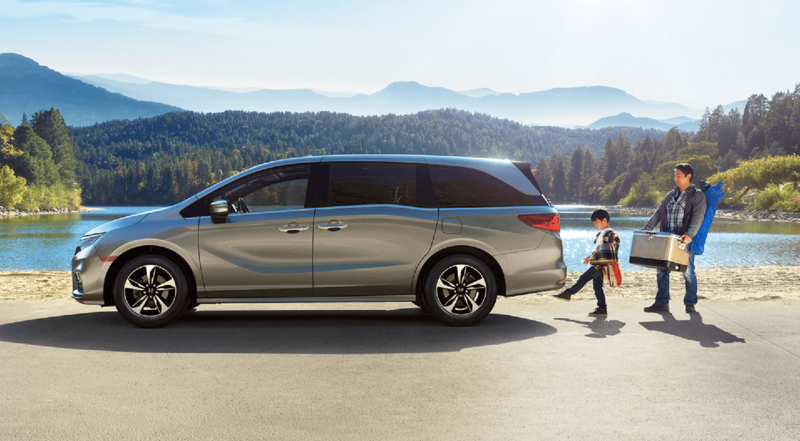 Our new and used dealership employs friendly, professional team members who look forward to catering to your needs and we'll happily review all the standard and available features this sleek minivan boasts, as well as the comprehensive Honda warranty that comes included with your purchase. With so many trim models to choose from and each one building on the systems and the features of the one before it, you're sure to find a Honda Odyssey that satisfies your search requirements. The LX trim features an array of standard features like an eight-way power adjustable driver's seat and a 3.5-liter V6 engine while the EX option offers a Smart Entry with Walk Away system. The EX-L adds to that leather-trimmed seating and a height-adjustable power tailgate, and the Touring offers a rear entertainment system and a CabinWatch™. If you're looking for a vehicle that offers heated and ventilated front seats, a wireless phone charger and rain-sensing windshield wipers, you're looking for a top-of-the-line 2018 Honda Odyssey Elite! Here at Ceilidh Honda, we understand that you're looking to secure a vehicle that not only offers visual appeal but brims with safety features that actively provide for your on-road needs. The 2018 Honda Odyssey can be equipped with Honda Sensing™, which targets four main areas so that you can drive with peace of mind. The Road Departure Mitigation System and the Collision Mitigation Braking System™ help you stay in control while the Adaptive Cruise Control feature ensures you're able to enjoy a safe cruising speed and a safe following distance. Add to that the Lane Keeping Assist System, and you've got one secure vehicle on your hands! Ceilidh Honda invites drivers in Pictou County and Antigonish, Nova Scotia over to our Honda dealership in New Glasgow to browse our affordable 2018 Honda Odyssey now! Visit us today or take advantage of our user-friendly website to explore our inventory from the comfort of your home!